One (1) Grand Prize winner and five (5) Runner Up winners will be selected by Administrator in a random drawing on or about March 1, 2019 from all eligible entries received and combined throughout the Sweepstakes Period. Odds of winning a prize depend on the number of eligible entries received and combined throughout the Sweepstakes Period. 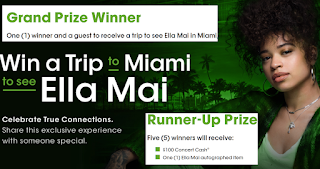 Grand Prize: One (1) Grand Prize winner will receive a trip for the Grand Prize winner and one (1) guest to attend the Ella Mai concert (the "Concert") at Revolution Live ("Venue") scheduled to take place in Fort Lauderdale, FL on March 21, 2019. Grand Prize winner and guest must travel on same itinerary. Trip consists of roundtrip, coach class air transportation from a major U.S. gateway airport nearest winner's residence to a Miami area airport, three (3) nights standard hotel accommodations (hotel to be determined by Sponsor at Sponsor's sole discretion; one room, double occupancy, room and tax only) from March 20 – 23, 2019, ground transportation to/from destination airport and hotel, ground transportation to/from hotel and Concert, two (2) premium tickets to the Concert, two (2) Concert VIP passes, two (2) Meet and Greet passes for use during the Concert to meet Ella Mai, one (1) $500 prepaid gift card, and one (1) Samsung smartphone (to be determined by Sponsor in its sole discretion) and twelve (12) months of Cricket Wireless service with its Unlimited Plan.Approximate Retail Value ("ARV") of Grand Prize: $6,000.00. Runner Up Prize: Five Runners Up (Each a "Runner Up winner" will receive a One Hundred Dollar ($100.00) Live Nation® Concert Cash® card and one (1) item of Ella Mai autographed memorabilia. Exact autographed item received to be determined by Live Nation, in its sole discretion. ARV of each Runner Up Prize: $600.00.